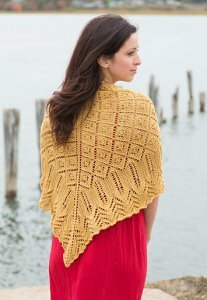 Taken from Classic Elite Sunny Day Booklet: "A triangular shawl worked from the center top to long lower edge in a sampling of eyelet stitches." This pattern is from Classic Elite Sunny Day Booklet, pg 22 - Kalinda. Size US 5-24" circular needles (or size needed to obtain gauge) and two stitch markers are required but not included. Finished Measurements: 62" x 29" after blocking. Gauge: 22 sts & 29 rows over 4"
Color Shown is #7150 Golden Honey.